(Newser) – US stocks powered broadly higher to reach more record highs on Wall Street, driven by big gains in banks. Bank of America jumped 3.9% Tuesday and JPMorgan Chase rose 3.5%. Banks rose after Federal Reserve chair nominee Jerome Powell said the Fed would consider easing up on financial regulations. Industrial companies also posted solid gains. Johnson Controls, for example, jumped 3.6 %. Investors also seemed encouraged by news that a Senate committee cleared the way for a tax reform bill to go before the full Senate. The Standard & Poor's 500 index rose 25 points, or 1%, to 2,627. 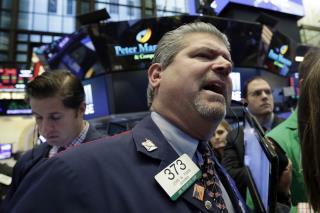 The Dow Jones industrial average gained 255 points, or 1.1%, to 23,836. The Nasdaq composite climbed 33 points, or 0.5%, to 6,912. Why do people get upset when they see others achieving success? Liberals should be happy they think they are getting a tax break on their riches while they think the dumb, poor, middle class, Republicans are seeing tax increases. Why are they so upset? Just be happy us dumb Republicans are being duped by our president. Why wouldn;t it go up? The Tax plan is good long term for both big business and the very rich. All around good day, if you are in the top 1~2% top wealth holders. The dow can't keep breaking records. Retards can't handle anything unless it is BS made up by the media.